“Regarding our long-term office plans, we are progressing our plans to construct an office building near the Ogle airport for long-term use,” Senior Director, Public and Government Affairs, Deedra Moe told Stabroek News. Through a sublease arrangement, on 10 acres of land leased to Ogle Airport Inc. (OAI) by the Guyana Lands and Surveys Commission (GL&SC), this newspaper understands that the company plans to construct a state-of-the art corporate headquarters. In July of last year, the company, through a number of advertisements, put out Requests For Information (RFI) pertaining to the construction it wants. The RFI was intended to gather information on the market for contractors who can provide all of the following services: construction of two buildings for 250 seats, an outdoor pavilion, paving, landscaping, fill and storm drainage, site utilities, plumbing utilities and electrical works. The advertisements said that ExxonMobil’s subsidiary, Esso Exploration & Production Guyana Limited (EEPGL), will provide the designs and blueprints of the buildings. The ads stated that the RFI will only be used to gather information. EEPGL will use the information supplied to select qualified suppliers for a future bid. Last year, the GL&SC entered a new 50-year lease with OAI, and OAI in turn with ExxonMobil. Since the APNU+AFC government took office, no lease has been given for more than 50 years. Article 16 of the old 2003 agreement between government and the OAI provided for a Review Panel, the purpose of which is to review the extent to which both sides— government and the OAI— are adhering to their obligations under the agreement. In May of 2016, the Ogle Airport was renamed, following weeks of a verbal battle waged continually between OAI and small operators at the facility that saw the triggering of a review of the agreement. A majority of the operators were against the renaming, as they said it would give an unfair advantage to the Correia Group, which is a major player in the company running the airport. A bid filed by the National Air Transport Association (NATA), which comprised nine aggrieved airport operators, to have the renaming halted, was unsuccessful. The nine operators were Air Services Limited (ASL), Roraima Airways, Hinterland Aviation, Oxford Aviation, Phoenix Airways, Domestic Airways, Jags Aviation, Wings Aviation and Hopkinson Mining Aviation. Against the background of claims made by NATA that the airport continued to be dominated by a single company through rigid control of the Board of OAI, Minister of Public Infrastructure, David Patterson, sought to assuage their concerns. He said that it was a private company managing government’s assets. “Operators who oppose today’s renaming have complained that this act will give an unfair advantage to a specific operator. Their concerns cannot be dismissed as something without merit, therefore, this will also be addressed during our review process,” he told them at the renaming. He said the concerns raised would not fall on deaf ears and that the renaming would not “drive the final nail in the coffin” of those who feel that they have become disadvantaged. However, days later, a controversial letter, signed by OAI’s Chief Executive Officer Anthony Mekdeci, was circulated to the media. In the letter, the CEO said that were it not for the investments made by OAI Chairman, Michael Correia, the renamed airport would not exist. More significant perhaps, was the assertion in Mekdeci’s letter that the now renamed Eugene F Correia International Airport is “100% built, owned and operated by a private sector company, Ogle Airport Inc.,” a remark that appeared at variance with the pronouncement made by Patterson. But NATA members continued arguing that in his capacity as OAI Chairman, Michael Correia had in fact recruited other functionaries at the airport to his side, in what had been a wresting of control of the facility. They said this allows the body holding the lease agreement for the management of what is now the Eugene F Correia International Airport, to exert control over the facility. Mekdeci sought to give background to the airport’s agreement with government. 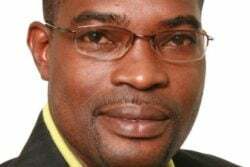 He said that the airport “was formally privatised by the Government of Guyana on July 17, 2003, when Ogle Airport Inc. entered into a 25-year, renewable up to 75 years, lease agreement with the Lands and Surveys Department for 441 acres, therefore passing title of the land to the company. This land lease issued to OAI by the Government of Guyana, was previously and specifically conditioned by a lease agreement for the ‘Management Operation and Development of the Airport,’ entered into between the Government of Guyana and Ogle Airport Inc. on November 5, 2001. OAI’s Public Relations Consultant, Kit Nascimento, had added that in March 2000, OAI was incorporated with equal shareholders held by five operators: Trans Guyana Airways, Air Services Limited, Roraima Airways Limited, Kayman Sankar Aviation and Hinterland Tours Inc. “On the 5th November, 2001, the government entered into a Lease Agreement with OAI conditioned by mandatory obligations under a two-phased project requiring the construction of an 800 meter runway to meet International Civil Aviation Organization (ICAO) specifications, associated taxiways, aprons and ramps and terminal facilities, including a state-of-the-art control tower demanding an initial investment of approximately US$3 million in order to qualify the Airport as an international port of entry. On 17th July, 2003, the Lands & Surveys department, concomitant with the conditions set out in the Lease Agreement, granted a 441 acre lease of land (Master Lease) for 25 years, extendable for two further periods of 25 years. Phase I of the development under the Lease Agreement was successfully completed in 2009, when scheduled passenger operations commenced. Not a penny of state money was invested,” Nascimento stated. He said that as cash flow was required from the private investors to meet the mandatory capital investment under the Lease Agreement, calls on funds were equally made from each shareholder, when the airport’s income was insufficient to meet the demand. “However, a number of the shareholders reneged on their commitments to the project’s development, choosing, at the time, to invest in the development of their own airline operations and business interest. Unless, therefore, OAI could meet its obligations to develop the Airport, mandated under the Lease Agreement, the project would have collapsed, the Airport closed and the Operators required to move their operations to the Timehri Airport or close down. In order to save the project to build and develop the Airport, the Correia Group of Companies, along with Air Services Ltd, to a lesser extent, responded to the demand for funds. This decision was made with the unanimous agreement of the shareholders and in accord with an agreement between the shareholders established in 1999 that should any investor be unable to invest, the remaining shareholders would have the first right to refusal,” he said. “Yes, a single group of investors saved the Airport project by investing the majority of the funds for its development and now hold some sixty percent (60%) of the shares, but, that group does not and cannot exercise control of the Airport,” he added. But operators today are still lamenting the treatment they receive as unfair. “Exxon came in and in two years got a lease and are getting ready to build. Yet you have operators here applying years ago and still have not been able to expand or new companies set up on available areas. They talk about local content but where is the local content?” one airport operator questioned.